No, Kollibri isn't a Turkish Angora, he's Michael's new Norwegian Forest Kitten! Kollibri's first grand points at the Malibu show. 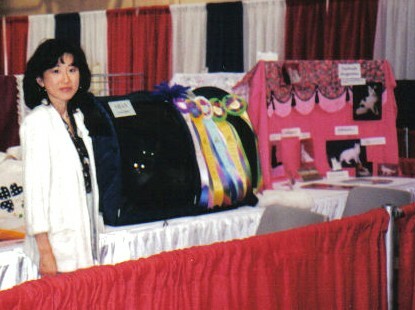 Anne and Lorraine's friend Yuko helping them show the cats at the Pet Fair. 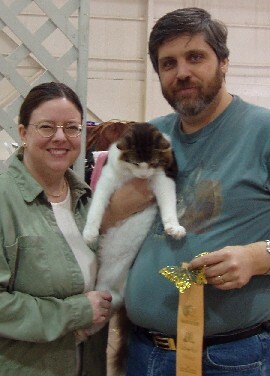 Southwest Region Turkish Angora Grand & DM party at the Santa Monica Show 2003. Copyright © 1996-2004 Lorraine Shelton. Photographic images are the copyrighted property of the photographer and may not be copied, downloaded, printed, or otherwise reproduced without the express permission of the photographer.